On April 12, 1776 at the meeting of the Fourth Provincial Congress, North Carolina's assembly authorized her delegates to the Continental Congress to vote for independence. At the same time, they cememted their resolve and intention on paper, writing their resolutions into the minutes of the their meeting. These revolutionary resolutions have become known as the Halifax Resolves. The resolves were the culmination of a year of discussions in conferences at the county level across the colony, and it was the first official action by a colony that called for severance of ties to Britain and independence for the colonies. They were unanimously adopted by the 83 delegates assembled at Halifax and written into the meeting minutes. Today at least two copies of the Resolves are known to survive. The copy sent to the Continental Congress is held in the collection of the National Archives and the other is in the collection of the State Archives of North Carolina. The following is portion of the text of the Resolves and is excerpted from "Historical Miscellanea: An Early History of North Carolina," North Carolina Manual, 1991-1992, published biennially by the NC Department of the Secretary of State. It appears to your Committee that pursuant to the Plan concerted by the British Ministry for subjugating America, the King and Parliament of Great Britain have usurped a Power over the Persons and Properties of the People unlimited and uncontrouled and disregarding their humble Petitions for Peace, Liberty and safety, have made divers Legislative Acts, denouncing War Famine and every Species of Calamity daily employed in destroying the People and committing the most horrid devastations on the Country. That Governors in different Colonies have declared Protection to Slaves who should imbrue their Hands in the Blood of their Masters. That the Ships belonging to America are declared prizes of War and many of them have been violently seized and confiscated in consequence of which multitudes of the people have been destroyed or from easy Circumstances reduced to the most Lamentable distress. Resolved that the delegates for this Colony in the Continental Congress be impowered to concur with the other delegates of the other Colonies in declaring Independency, and forming foreign Alliances, resolving to this Colony the Sole, and Exclusive right of forming a Constitution and Laws for this Colony, and of appointing delegates from time to time (under the direction of a general Representation thereof to meet the delegates of the other Colonies for such purposes as shall be hereafter pointed out. A list of attendees to the Provincial Congress at Halifax in April 1776 can be found in the full-text transcription of the assembly records in the State and Colonial Records of North Carolina, at http://docsouth.unc.edu/csr/index.html/document/csr10-0250. North Carolina. Secretary of State; North Carolina. Legislative Reference Library; North Carolina Historical Commission. North Carolina manual [serial]. [Raleigh]: North Carolina Historical Commission. Tomberlin, Jason. 2007. 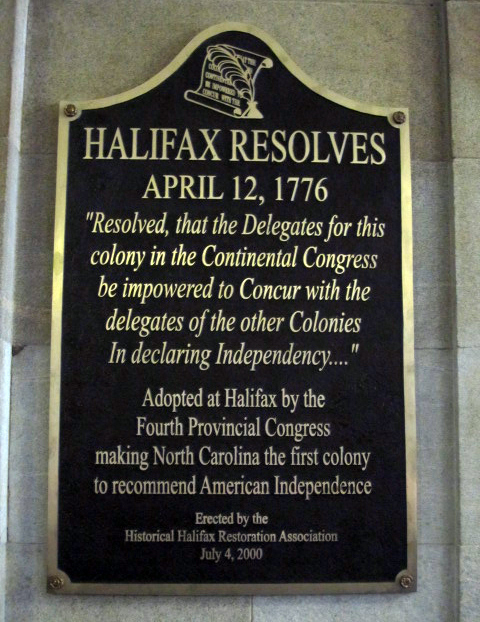 "April 1776: The Halifax Resolves," This Month in North Carolina History (April). http://www.lib.unc.edu/ncc/ref/nchistory/apr2007/index.html. WorldCat (Searches numerous library catalogs). Where might I buy a copy of the original Halifax Resolves? That’s a very good question! Unfortunately, I’m not aware that the document is available in a facsimile reproduction. I’m checking with the State Archives of North Carolina to see if a digital copy is available. I've replied to you at the email address you left with your comment. And I’ll be back in touch shortly. My 6th great grandfather is Henry Perkins. One of his sons named Solomon Perkins (my 5th great uncle) name is on the Halifax Resolves document. He was Colonel Solomon Perkins and fought at the Battle of Brier Creek. His brother Moses Perkins is my 5th great grandfather and he too was a Revolutionary War veteran. They were from Currituck, North Carolina. Haven't found where Henry Perkins came from or his father's name. Excellent information. Thanks. Who were the 83 delegates who signed the Halifax Resolves? Am interested in the ones from North Carolina. That’s a great question! For starters, please visit the State and Colonial Records of North Carolina. Here is a link to a full-text transcribed version beginning with the meeting at Halifax in April of 1776. You’ll see a list of those who attended with their respective counties -- http://docsouth.unc.edu/csr/index.html/document/csr10-0250. And I will update the entry with this link showing attendees for future visitors. I have contacted the Halifax state historic site and have spoken to the site historian to get a bit more information about the resolves document. Unlike the Declaration of Independence, the Halifax Resolves had no signers. The resolves were unanimously passed by the Colonial Assembly (Provinicial Congress) in the course of business conducted at the gathering in April 1776. The only signature that appears is that of the assembly clerk, James Green. I hope this helps! And I'm sending this information to the email address you left with your post. I talk about the Halifax Resolves every time I give a tour of Independence Hall. This entry will be going in our reference binder in the West Wing (where Dunlap broadsides of the Declaration of Independence, Articles of Confederation, and U.S. Constitution are displayed). That's fabulous and thanks for sharing this with us! We're glad to be able to share this content with you. I think the halifax resolve is the best thing ive ever read!!!!!!!!!!!!!!!!!!! That's terrific! We're glad you found something you enjoyed on NCpedia and thanks for taking a minute to let us know. Please visit us again!